My assessment of Food 4 Wealth – The whole experience from the sales page to a blow by blow account of the product itself! Welcome to the first part in my review of Food 4 Wealth. I intend to do a thorough review, not just a few paragraphs and then tell you to ‘buy through my link’. What I want to do is go through the whole program and I will comment on what I find, my impressions and thoughts which will include the good and the bad… should I find any. This means that my review will be published in parts, at this point I am not sure just how many. The first part being the sales letter, reviewing the promises and the presentation, then I will move onto the product. Reviewing the product will mean I will review the manual, ebook, section by section, then I will review the videos. I will comment on things like presentation, again, as well as ease of use. Not only presentation of the content, but also presentation of the actual product itself, how easy it is to access the content, and download it etc. I have only just received access to the product and while I won’t give away too much, as I go through, I do want to provide an honest and thorough review of the whole thing (how many times have I said ‘thorough’? …lol). Let me start out by saying that I love organic gardening. I really get a kick out of being able to be self-sufficient in any way possible, and I think with the way the world is going it only makes sense to be prepared. In fact, I have just started a website called Survival Skill Experts. It is brand new and how it looks at the moment will not be anything like the end result (actually, thinking about that, there never ever, is any ‘end result‘ really because we keep working on our sites forever! Lol ). I liked the look of the page, nice and clean with professional graphics… Nice color scheme. If you are like me, you probably scroll up and down the page for a quick look… check out the price etc. A positive note, for me, there is no ‘never ending’ long sales letter, which is great, so long as they are able to convey enough information in the space they use. My first thought was that these guys seem to be knowing what they are doing, at least with their online presence; professional without being to ‘salesy’, another good point. Seeing how this is an ‘organic gardening’ product review I won’t go too much into the sales aspect except to say that a professional site does inspire confidence, so I am starting out this experience on a positive note. 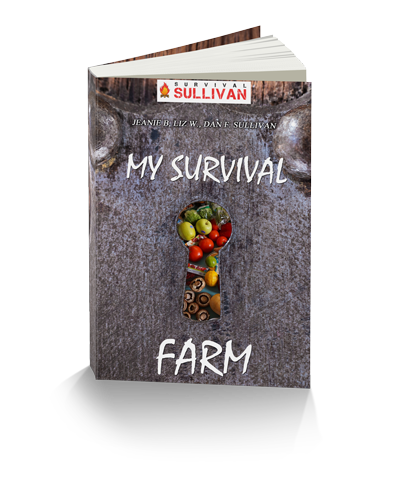 The headline sets the tone, and provides a big promise straight out the gate – “Absolutely everything you need to know to grow healthy, fresh organic food, without all the problems.” Great… that is, so long as it delivers on the promise. Jonathan White then introduces himself in a short video. This is great, I get to see the ‘real’ person behind this product; helps me decide if I can trust him or not. He seems like a nice genuine sort of bloke (Aussie vernacular for guy). Some products use actors to do this stuff. These guys don’t, which is a relief, I find those ‘glossy’ unrealistic looking people don’t do it for me, and these guys are fellow Aussies, so that is another plus… for me at least! Jonathan White is an Horticulturalist and Environmental Scientist so I guess this makes him very qualified to put together such a product. 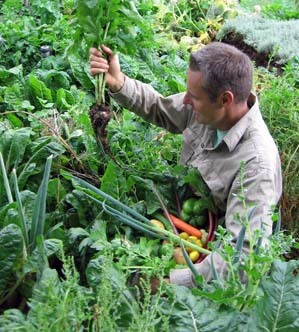 He again promises that you can be producing yummy fresh vegetables in your back yard with little effort (that’s the bit I am finding hard to believe… but again, we’ll see). For your $39.97 price tag you get the ebook as well as the video tutorials…. Which, if they deliver on all the promises, sounds like a pretty good deal to me! Just when I thought the promises couldn’t get any bigger, Jonathan hits us with this… “how to set up a plot, and how to look after it, so it only requires 8 hours of lite, easy effort per YEAR!!”. I find that somewhat astonishing… So now I am really looking forward to getting into the ebook and the videos. I guess this is one ebook, I am going to have to read 🙂 I must say if my garden looked half as good as the one in the video I would be chuffed indeed. Perhaps I should comment on the title. I don’t really like numbers in names instead of the word, so ‘Food 4 Wealth’ instead of ‘Food For Wealth’, I prefer the latter, but that’s just a personal thing… Perhaps I am too conservative. I do however, really like the concept and what the name conveys. With the way things are going in the world, the real wealth will be if we can provide ourselves with fresh healthy organic food. 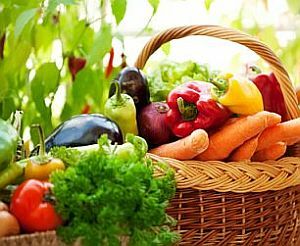 It seems to be fast coming to that, but even if it didn’t become that dire, it just sounds like good common sense to be able to improve your own health and that of your family by growing your own organic vegetables, not to mention the money you can save. Jonathan mentions it can save you up to $5000 a year, and that is not small change; well not for most of us. So moving on to the bullet points, there are a bunch of other great benefits to getting a hold of Jonathan’s system, including being able to produce many times more than a traditional garden and here they re-state the claim of only 8 hours a year…. (still find that amazing). The system promises you, being able to harvest every day of the year, no matter where you live. I wonder about that point as well, because it is all very well for us here in Australia that has very little extreme weather conditions, compared to say the full on snowy winters in other parts of the world. His system is a NO DIG system, repels pests naturally, virtually no weeds, organically grown, works in any soil and in any place in the World. They show you how to collect your own seeds. To me this is a really valuable thing to know how to do. It means you never have to buy seeds again! Of course it means also that you stick to non genetically altered fruit and veg, which I think is a better way to go, and what we need to be doing anyway. They also cover seedling production and point out that you can actually produce enough, not only for your own needs but to be able to sell. I know this would be a great advantage for a lot of people trying to be self-sufficient on their plot of land. They say, you should be able to not only sell seedlings, but also the excess produce and if it tastes and looks as good as it sounds, then you should have an almost never ending stream of happy customers begging for more. Jonathan claims that his style of gardening regenerates itself, year after year, and is all environmentally and ecologically friendly. Of course you can also easily use your household waste to fertilize your garden goldmine which is utilizing recycling! An Ecology Focus not an Horticulture focus – it is said that traditional gardening seems to mostly revolve around ‘fixing problems’, most of which are unnecessary if you implement ‘Food4Health‘ system. To me, the idea of ecological food production sounds very attractive and really appeals to my sustainable living values, and Jonathan claims his system is the ‘way of the future’, to which I can only add, I certainly hope so! Along with the step by step and easy to follow instruction manual – which is the downloadable ebook (of course you can print all or just bits of it, if you prefer a hard copy), you also get 14 short video tutorials which total over 60mins. There is a link to a long list of email testimonials which when you click, opens in a popup window. I like that they didn’t extend the length of the sales page with all these testimonials, as I can easily click to view them if I desire to do that. The testimonials seem to be from a variety of locations around the world, which is also good. The product is offered through Clickbank, which is a very safe and secure way to purchase, and again for me, they make it even better, by providing PayPal payment, which is what I always prefer to do, as it keeps my purchases all in the one place, and is quick and convenient… suits me. There is a nice summary of the program in a box in the middle, with a fresh veggie graphic, followed by a short story as to what prompted Jonathan to develop this method of gardening. Jonathan also explains how he partnered up with Michael Guilfoyle, the owner of Web hosting company M6.net, who helped him put this package together and be able to offer it online. He hopes to be able to reach the most number of people by selling this system online, and would like to think that once he starts to make some real money, then he will be in a position to take his system to the poorer parts of the world where people don’t have access to the Internet. So here he is putting forward some worthy altruistic goals, which one would hope can become a reality. There is a full 60 day guarantee, so really no risk to anyone who decides to purchase. Now, just jumping back up to the top of the page I notice that there are a few links. Not sure this is good from a marketing point of view, but at least they offer some good information. Here I am mostly referring to their FAQ page. Here they answer some of the questions that you might have before you commit to purchasing. To summarize, I think the product sounds excellent… I said, ‘sounds’, so now I am looking forward to seeing if it lives up to the rather steep promises – 8 hours of work a year! Will it meet our expectations? Stay posted…. If you want to make sure you don’t miss the rest of my Food 4 Wealth review and other articles, please sign up for updates and I will let you know when the next post is published.